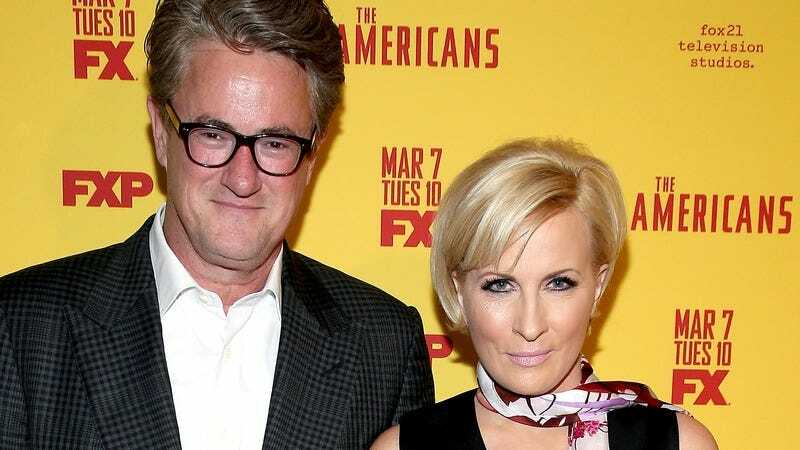 Joe Scarborough and Mika Brzezinski—the will-they-won’t-they couple of cable news political chatter—have announced that they are engaged. The longtime co-hosts, who have been famously cagey about their personal relationship, initially shared the news in an interview with Vanity Fair, but most of their viewing audience likely found out this morning, when their guests offered them congratulations on air and everything got visibly uncomfortable. Confirming rumors that initially swirled in Page Six, Scarborough and Brzezinski explained to VF that Scarborough had proposed like any fancy person would—by taking Brzezinski on a trip to the French Riviera. It’s ostensibly a happy and romantic story, yet when Harold Ford Jr. offered them a vague “congratulations” on Morning Joe this morning, you could feel the room tense up.